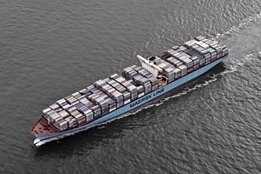 Mega-shipowner Maersk is to put a limited number of scrubbing units on its box ship fleet as part of its IMO 2020 compliance strategy after all, the head of Maersk Oil Trading has said. The move comes after initially adopting a firm stance on the matter in 2017, telling Ship & Bunker at the time "scrubbers will not be the way forward for our fleet." That stance seemed to soften slightly last month, with Group CEO Søren Skou saying his company may now invest in a few scrubbers "simply to understand the technology," while also reiterating he had said "many, many times [that] we don't like the solution." But in a statement released Tuesday to Ship & Bunker, Maersk says it will now invest in a "limited" number of scrubbers "to ensure compliance in time." "Maersk is looking into all possible and available opportunities to ensure we are ready to comply with the 2020 sulphur cap, that is compliant fuels, LNG and scrubbers. As part of the preparations we have decided to invest in new scrubber technology on a limited number of vessels in our fleet of around 750 container vessels," said Niels Henrik Lindegaard, Head of Maersk Oil Trading. "Using scrubber technology is a small part of – and just one of several elements in – our overall 2020 fuel sourcing strategy to ensure compliance in time." However, sourcing compliant fuel remains the core plank of the company's IMO 2020 strategy. "We still believe the best solution remains with compliant fuels from refineries on land," Lindegaard said. Last month Maersk also announced its own 0.50% max sulfur supply plans in partnership with Vopak in Rotterdam. Lindegaard says that will cater for around 20% of its complaint fuel needs, and "we are looking into more bunkering facilities like this." At its offices in Olso.